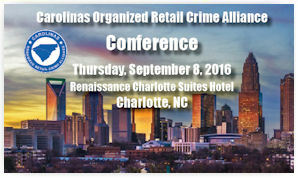 Join us for the premier conference of the Carolinas Organized Retail Crime Alliance (CORCA)! This event will bring law enforcement together with retailers specializing in asset protection, loss prevention, and emergency and risk management fields, along with prosecutors, district attorneys, and policy makers. This will provide an opportunity to network, learn about the trends surrounding retail crime in the Carolinas, and connect with vendors on innovative products in the field today. A wide-range of topics will be covered throughout the day at both the general and breakout sessions. Presentations will be focused on some of the most pressing retail crime issues, such as organized retail crime, cybersecurity, return fraud, e-commerce, emergency preparedness, asset protection technology, and the private and public sector partnerships in the Carolinas. The incomparable exchange of knowledge will benefit retailers, law enforcement, and other partners across the Carolinas. Our area is a hub for organized retail crime with major highways, such as Interstates 85 and 95, running along the eastern corridor and right through North and South Carolina. It is imperative that we work together to strengthen and expand this alliance, because together we can better identify organized retail theft networks and combat retail crime.